Gilbert & Sullivan’s 8th Collaboration – Sullivan’s score has been called majestic, and the beloved sequence of songs in Act II is known as the “string of pearls”. Show times: Wed – Sat @ 7:30pm; Matinees Apr 28, May 4, 5 & 11 @ 2:00pm. See the ticketing website for full details. Princess Ida is having nothing to do with men, never mind love, or marriage. She is so firm in her belief that she has locked herself away in a University, attended only by women, and that is exactly where she plans to stay. She was betrothed to young Prince Hilarion from a very early age, and her failure to arrive to meet him with her father, King Gama, could be interpreted as an act of war, but still, she is having none of it. In fact, she’s willing to fight the men who show up on her doorstep if need be. Her fellow chaste and heretofore uninterested female friends, on the other hand, find themselves face to face with Cupid and less keen to do battle. 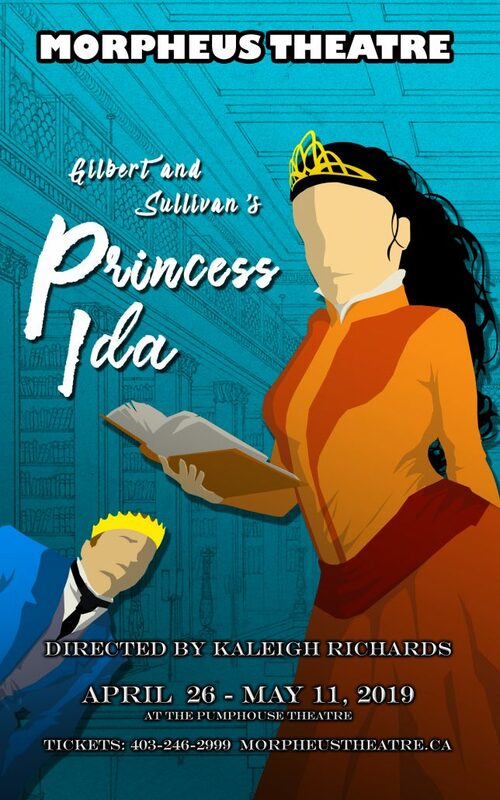 A lesser known work of the dynamic duo, Princess Ida is nonetheless brimming with those qualities we love in the works of Gilbert and Sullivan: humour, sweeping and intelligent lyrics, witty commentary, danger and commotion! In the end, love wins the day, and for more than just our royal couple. It’s an exciting conclusion to our 24th season, so jump for joy and gaily bound down to the theatre to join us for Princess Ida!